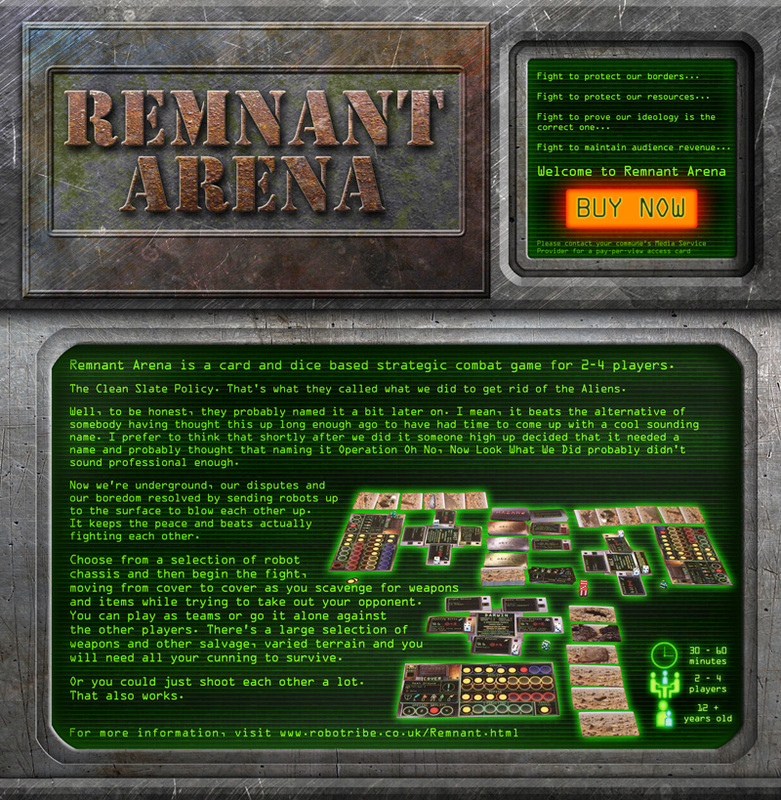 Remnant Arena is a card and dice based combat game for two to four players. After the Aliens visited and forced the Clean Slate policy to be used to remove them, the human population moved underground to avoid the radiation. The enclosed spaces made conventional warfare unfeasible, therefore all territorial or political disputes are resolved through combat on the surface. It was decided that due to the background radiation on the surface, the current shortage of population, the number of obsolete robots and their lack of blood bypassing any qualms about the live televising of warfare, the remnants of each commune's Mechanised Peacekeeping Corps were drafted in for this purpose. The game can be played by two to four players, either as team against team or all against each other. Each of the robot chassis have a different style of play and special abilities. There is a large collection of salvaged weapons and equipment that can be picked up as you move from cover to cover, all the while making sure you don't overexert yourself and leave yourself open to a counterattack. There's a strong mix of strategy and luck when you play the game. Each player draws from a deck of terrain cards that they can take cover behind, when they reach that cover they find out if they've found any useful salvage. Moving from cover to cover uses up agility that could otherwise be used for dodging enemy attacks, however moving around is the only way to pick up better kit or ammo. Each player takes control of one of twelve different chassis, each with individual strengths and weaknesses that can change the tactics for and against them. The Scout is a fast robot that needs to stay in cover due to it's weak armour, however due to it's speed it can often find lots of good equipment. The Hulk is almost the opposite, it's very slow so you have to conserve ammo whenever possible. That said, you can withstand massive punishment so it's okay to occasionally find yourself not quite able to reach cover. See 'A Quick Guide to Chassis' on the left to see more details of each chassis type. You start with some basic supplies like the Machine Gun or a Smoke Bomb, as the game proceeds you start picking up much more powerful equipment. If you're really lucky you may find the Minigun, Explosive Rounds or even get access to an Orbital Laser (not accurate enough to hit your opponent but very handy for removing obstructions). This is a very complex game but the whole design has been written with the goal of making it completely intuitive. If you think a card or a rule works in a particular way then chances are it does, all the information you need is on the cards in front of you. If you hide in trees then beware fire, taking cover behind a truck is good as long as there's nothing dangerous in the tank. If you hide in a cave then it's great defense but with only one way out it's risky when you leave and you need to hope nobody throws a grenade in there with you. Rather than having a massive board, this game uses a small board for each player to track their stats and equipment along with several decks of shared cards. This allows people to sit where they want at the table and still see everything that they need to. The game has now completed testing, we will keep this page updated with any news on the release schedule.